A well-made, preserved deck can be a source of much enjoyment for homeowners and their family and guests. Decks serve as a place of gathering for entertaining good friends and taking pleasure in eating with family. In order to enhance the beauty of the deck and to protect it from the elements, properly maintain your deck and weatherproof it against damage from the elements. When staining your deck, equip yourself with the proper supplies for each stage of the process. 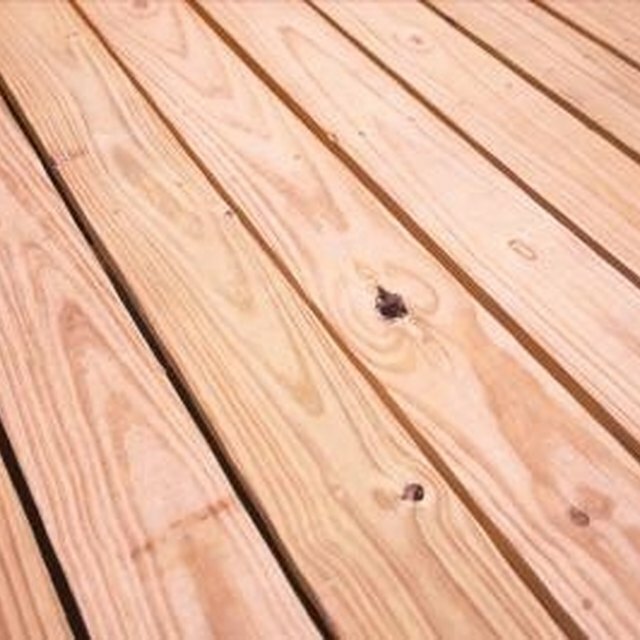 The first step to staining a deck is the preparation, and you will need the following equipment: a broom with good, stiff bristles (a shop push broom will work nicely); deck cleaning solution (can be purchased at any building supply or hardware store); a roller or pump sprayer to apply the cleaner; a stiff, synthetic-bristle brush and a garden hose or power washer. After removing all the debris, apply the cleaning solution and allow it to set for 15 minutes; scrub thoroughly with the brush to remove all residue. Rinse the deck free of cleaner and allow it to completely dry. If there is any new wood, use sandpaper to lightly sand away any residue. Allow 2 to 3 days for the wood to completely dry--sprinkle a few drops of water on to the deck to see if it is absorbed--then select an appropriate waterproofer or stain in sufficient quantities to cover the square area included in the deck. The directions on the product will contain the necessary formula to determine the proper amount. Gather a paint tray or similar container to hold the stain. Using a roller, spread the stain over the deck in an even coat, and then use a 4-inch brush to work the stain into the wood Tools for applying the stain include a paint tray, roller, 4-inch brush and stain A second coat may be necessary, but you should wait 4 hours between applications. Drying time is dependent on both temperature and humidity and will require approximately 24 to 48 hours. The final step is the clean up of the project. Clean your brushes and rollers properly, and this depends on which type of stain you used. If you used an alkyd/oil solid-color or semi-transparent stain, then use a solvent available at most department and building supply stores. For latex solid-color stain, soap and water is sufficient to wash the tools. Brushes should be stored dry and in their original wrapper or in such a way that their original shape is maintained. Save a small amount of stain for touch-ups by tapping the lid down securely with a rubber mallet. Dispose of the remaining leftover stain at an appropriate waste-disposal site and never pour it down the drain or into a storm sewer.